CHINA was again Australia’s major coarse grains customer in June, taking 512,181 tonnes of barley and sorghum in total of the 658,656t shipped for the month, according to the latest export data from the Australian Bureau of Statistics (ABS). 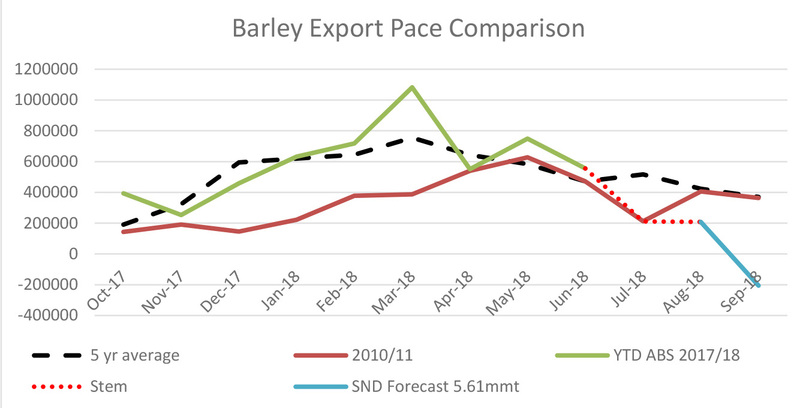 Shipping stems indicate barley exports are now likely to tail off following above-average shipments in March in particular, and some vessels nominated will be ferrying grain from southern Australian ports to Brisbane and Newcastle to supply the drought-affected eastern market. Likewise, sorghum shipments are now likely to slow, a function of nearly all of Australia’s 2018 export surplus coming from Central Queensland, and its harvest being well and truly over. A much smaller-than-average amount of sorghum grown in New South Wales and southern Queensland has made its way to export this year, because of high domestic demand and limited production as a result of dry conditions in some areas. Table 1: ABS malting barley export figures for April, May and June 2018. Table 2: ABS feed barley export figures for April, May and June 2018. Table 3: ABS sorghum export figures for April, May and June 2018.